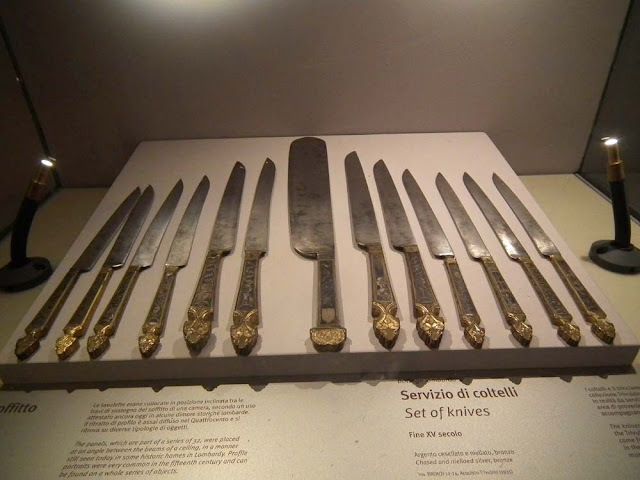 This set of knives from the end of the 15th century is displayed in the Castello Sforzesco. They are made of chased and nielloed silver, and bronze. Milan in the 15th century was by far the most active and reknowned centre of arms and armour manufacture in Europe. All the metalworking trades would have been closely connected and influenced one another, so it is no surprise to see fine cutlery from this period too. 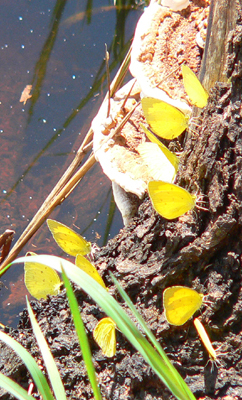 These bright yellow butterflies congregating by the water at Fogg Dam in the Northern Territory of Australia are some sort of Grass Yellow Eurema sp. I would guess they are the monsoon form of the Large Grass Yellow Eurema hecata phoebe. They seem to be sucking something up from the tree trunk they have alighted on. The wood is so close to the water it may be waterlogged, or it may be oozing some internal liquid. A la cuisine hier: Comfort food, in the form of David Lebovitz's Spaghetti Pie. I used fusilli, comté, parmesan and cheddar(thanks Gaynor!) . It worked well (minimal leakage) and was tasty and filling, with loads of leftovers for the freezer. I served it with a salad of coeurs de batavia bought at the market earlier in the day, tomato, gherkin and vinaigrette. Dessert was stewed peaches from the freezer. 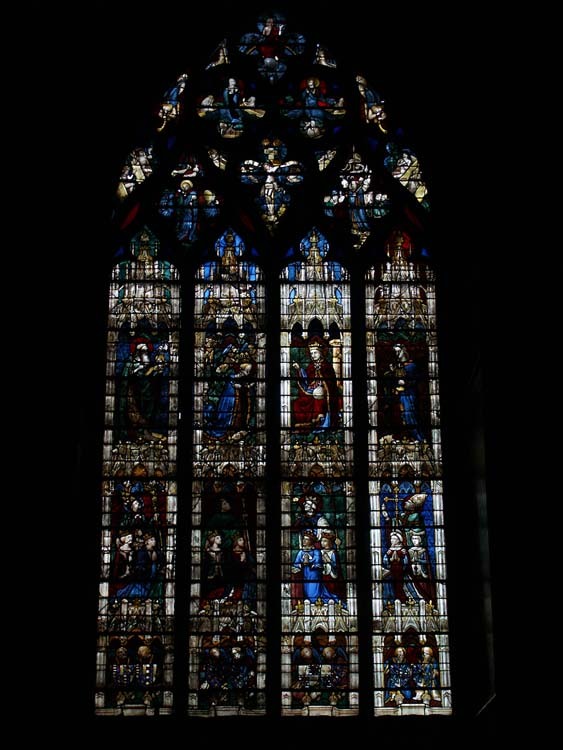 A Tourangeau stained glass conservator has invented a particularly innovative method of protecting the great cathedral windows. It's a kind of invisible and everlasting secondary glazing, originally developed for protecting the stained glass windows of Tours Saint Gatien's Cathedral. 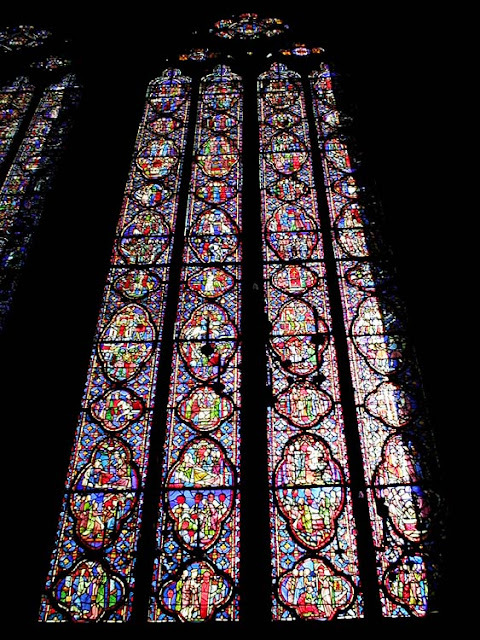 Stained glass windows in Tours Cathedral (after conservation). At the moment the Tours workshop is dealing with a 13th century window with 17th century elements from Chartres. It is Bay 116 from the famous Cathedral there, 45 square metres of stained glass, and has been in the workshop for two years already being conserved. 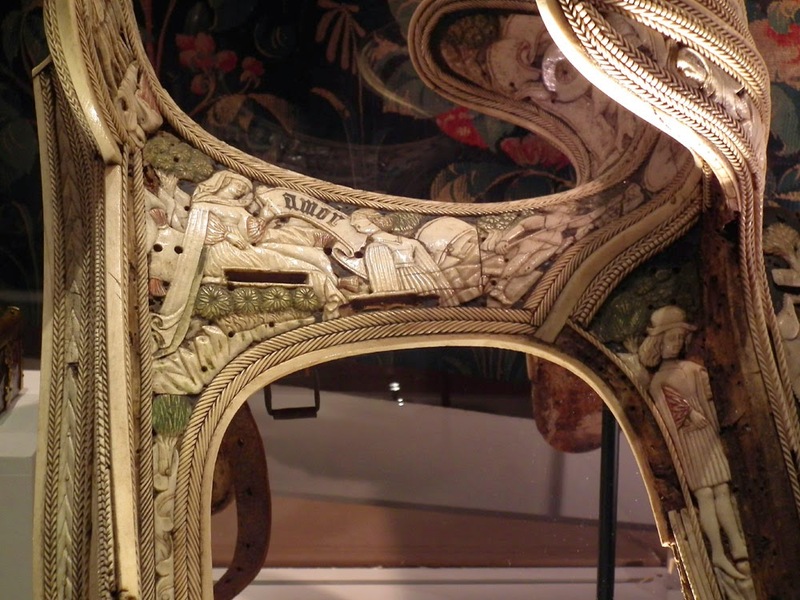 They also have a window from Reims they are working on at the moment. 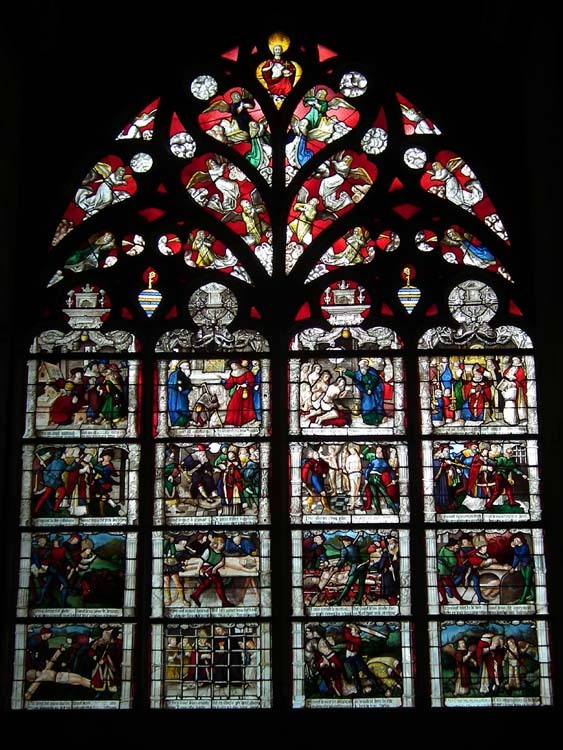 Previously the workshop conserved Bay 110 from Chartres, and they have done windows from la Sainte Chapelle and Bourges. 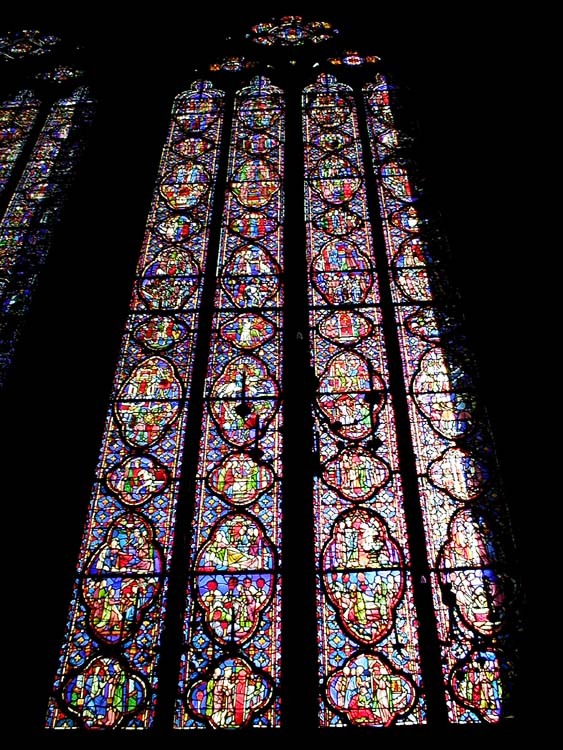 A stained glass window in La Sainte Chapelle, Paris (before conservation). Stained glass suffers on two fronts in situ. On the inside it gets dirty from candle soot. On the outside it is affected by acid rain and other forms of pollution. Ordinary secondary glazing on the outside will protect the stained glass, but it is reflective and unattractive. 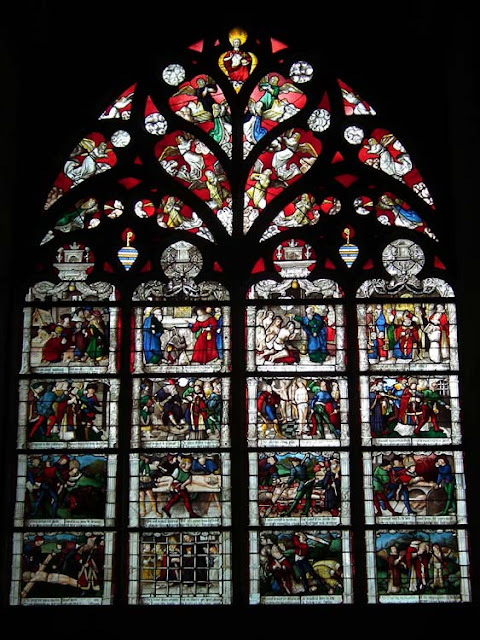 A stained glass window in Chartres Cathedral (before conservation). The Tours workshop of Hervé Debitus have developed a technique of secondary glazing which is not attached to the stained glass, leaving a gap for air flow to prevent condensation. The pattern of the stained glass is lightly sketched on the secondary layer, following the lead cames and the broad colour scheme. Then the new glass panel is baked, giving it a patina and making the pattern variable and not flat. Light passes through the new panel in much the same way as the old glass, resulting in a more sensitive presentation. This protective panel is only attached after the original window itself has been restored. A stained glass window in Bourges Cathedral. Loire Valley Nature: A new entry has been added for Western Clubtail Gomphus pulchellus. Nowhere else in Europe can you see so many species of Gomphid dragonflies in one area, and they can be tricky to tell apart. This is one of the common ones. Anyone familiar with Henry VIII's Palace of Hampton Court on the outskirts of London will know about the Great Vine. It's one of the oldest grape vines in the world and the longest. Most impressively of all it's still highly productive at 240+ years old. 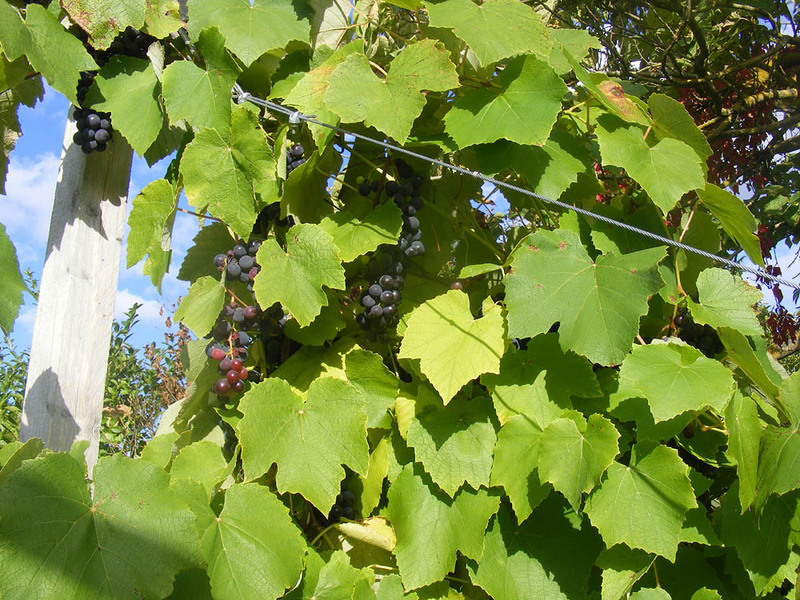 It is a Black Hamburg variety of table grape and was planted in 1769 under the watchful eye of Capability Brown. The plant at Hampton Court was propagated by cutting from a vine growing at Valentines Mansion in Essex which had been planted somewhat earlier in the decade. Today it averages a crop of around 275 kg, has a trunk measuring 4 metres around and stretches for 36.5 metres. The Great Vine has been cossetted from its very earliest days, with its own greenhouse, regular fertilising and careful pruning. The job of Keeper of the Vine is full time and she lives on site. Our own humble vine, also a Black Hamburg, has no chance of reaching the sort of dimensions or lifespan of the Hampton Court Vine. However, it was planted for similar reasons perhaps twenty or thirty years ago. 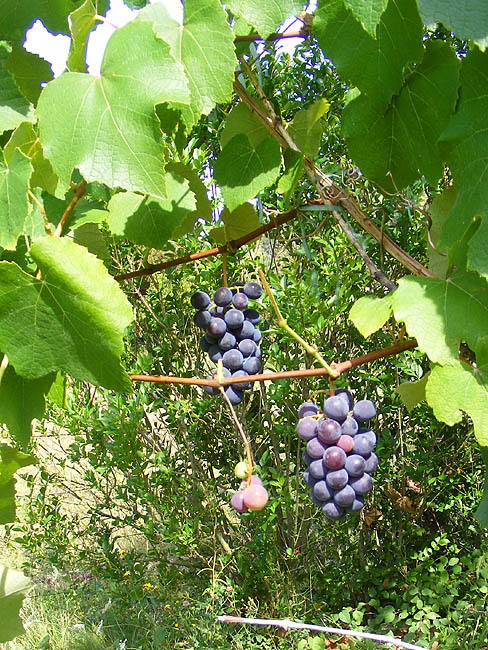 Black Hamburg may be an old fashioned type of table grape, with small fruits and large seeds, but it was planted for its tasty honey flavoured grapes and its generous productivity. Even if our vine is a mere tiddler compared to the Great Vine, it regularly gives more grapes than we quite know what to do with. Loire Valley Nature: A new entry has been added for the uncommon Autumn Squill Scilla autumnalis. A new entry has been added for Beech Fagus sylvatica, surprisingly rare in the Touraine Loire Valley. 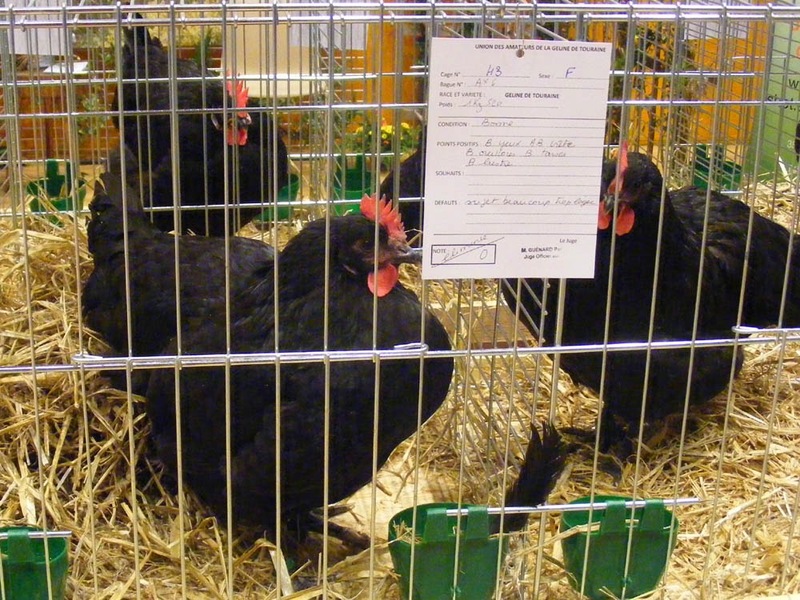 Bléré council has set up a scheme where householders can put their name down for two Gélines de Touraine, a local rare breed of chook. For a number of years Bléré council has been seeking to reduce household waste. One of their more innovative schemes is to offer residents two recycling chooks for a fee of €15. A chook can eat 150kg of organic waste a year. The scheme is at this stage limited by the number of Gélines available, so 60 households have been issued with chooks. The chooks are supplied by a local breeder based at Genillé. The Bléré town website provides guidelines for the care of the chooks. They must have a shelter of two to three square metres with a perch 1.2 m above ground, in a quiet, not too bright spot. It is forbidden to feed them citrus or potato peelings, but otherwise they are to eat kitchen scraps augmented by wheat and grass. Water must be provided. Tips on how many eggs to expect and how long they will keep are provided on the website. 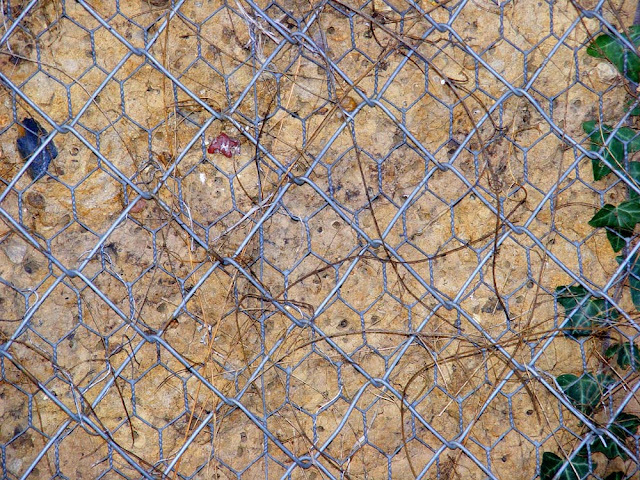 The council also points out that chook poo is great garden fertilizer. Last but not least tips on how to identify and deal with a sick chook are provided. As well as private households, five schools in the area have taken Gélines. On 25 February 1916 Robert Percy Brand arrived in France (possibly at Boulogne sur Mer) as part of reinforcements for the 2nd batallion, 10th Essex Regiment. At that time the regiment was based around Flesselleson the Somme. Loire Valley Nature: A new entry has been added for Long-tailed Blue Lampides boeticus, a butterfly that can be encountered almost anywhere in the world. A new entry has been added for Small Copper Lycaena phlaeas, a butterfly that has shockingly declined in recent years. A photo has been added to the Map Araschinia levana entry. A photo of a caterpillar in our orchard has been added to the entry for Swallowtail Papilio machaon. Photos and identification tips for Amethyst Broomrape Orobanche amethystea have been added to the entry on Broomrapes Orobanche spp. This fireplace (Fr. une cheminée) is in the sitting room (Fr. le salon) of the house of some friends. 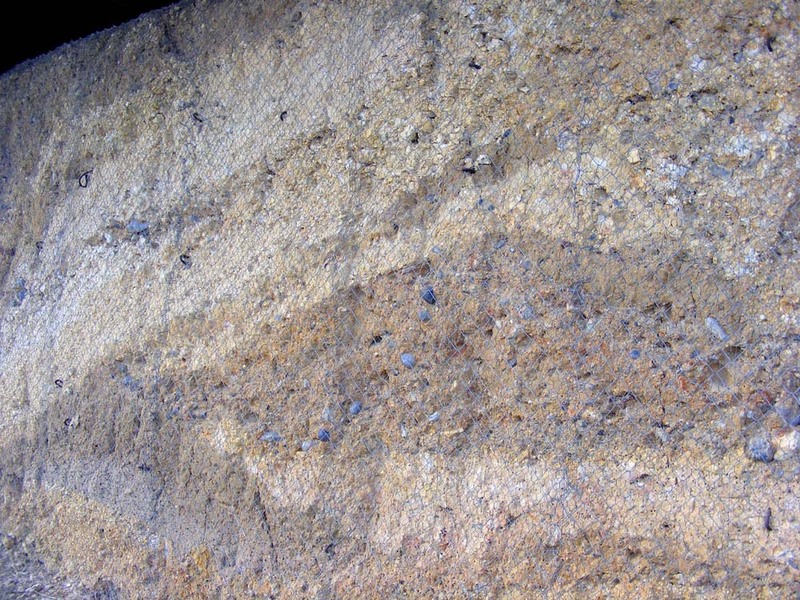 The fireplace itself is made from the local limestone (Fr. le tuffeau). On the left is a chestnut roasting pan (Fr. une poêle à trous), on the right a pair of bellows (Fr. un soufflet) and fire irons (Fr. une garniture de foyer). In front of the fireplace is a firescreen (Fr. un pare-feu). The fire is built on a grate (Fr. 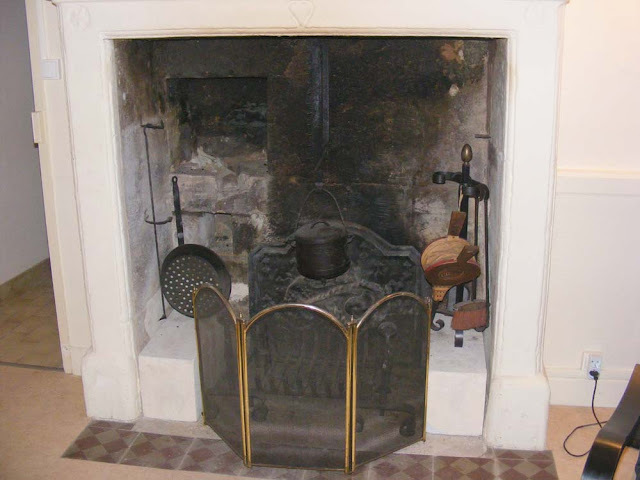 une grille de foyer), behind which is a cast iron fireback (Fr. une plaque de cheminée en fonte). Hanging from a chimney hook (Fr. une crémaillère) is a cast iron lidded pot (Fr. une cocotte). 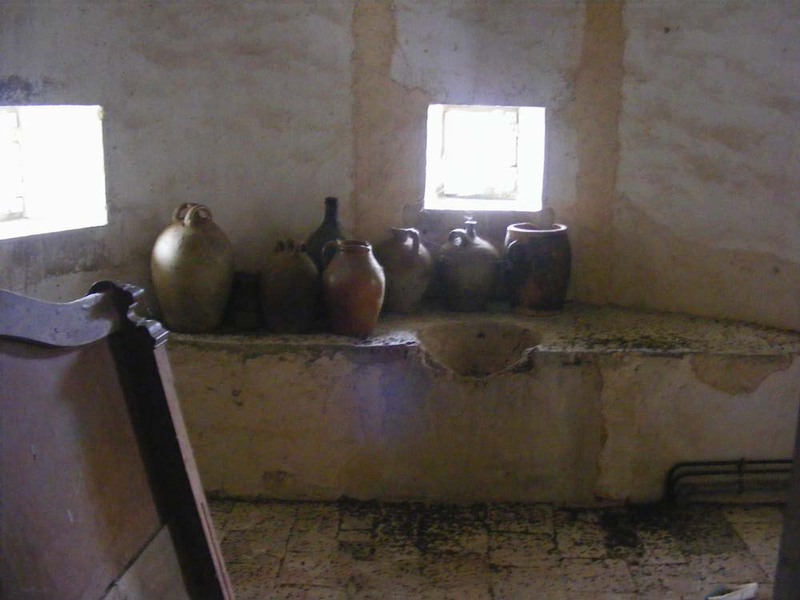 Most interesting of all, at the back on the left is a niche for a brazier (Fr. un potager) for slow cooking or keeping food warm. Original decoration on beams in a bedroom. A long steep staircase from ground floor to first. 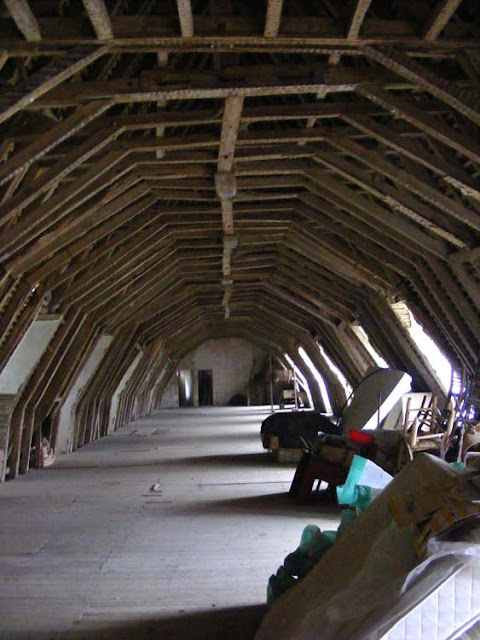 The attic, known as the dortoir (dormitory). storeys to the next floor below. A bathroom in the attic, maybe 19th century, perhaps even earlier. 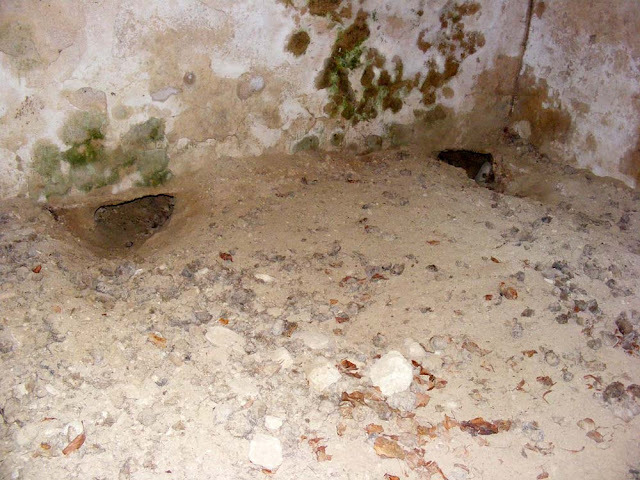 The black stuff scattered everywhere is bat poo (what Virginie, the mammal expert who leads the twice yearly bat surveys would refer to as les crottes magnifiques). The room is obviously a significant summer roost. Le temps hier: It was so mild yesterday that I didn't bother lighting the wood stove until lunchtime. The house was 18.5°C inside when I got up, with no heating on at all. Loire Valley Nature: A new entry has been added for Green-underside Blue Glaucopsyche alexis, a large and lovely blue butterfly. A photo of the tangerine underside of a Jersey Tiger moth Euplagia quadripunctaria has been added to the entry for that species. 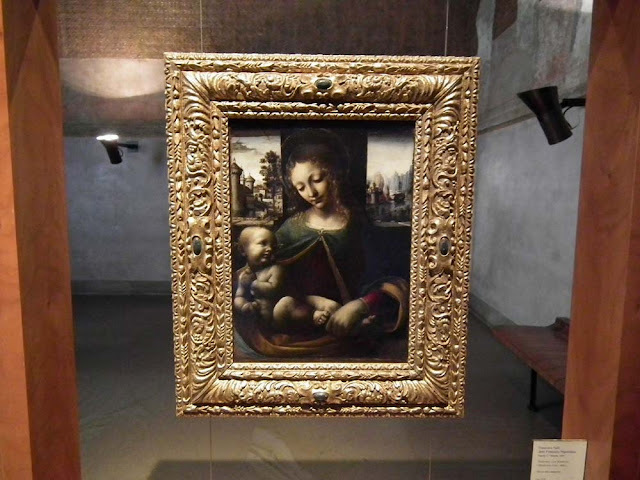 Looking at this lovely Madonna and Child hanging in the Castello Sforzesco you would be forgiven for thinking it was by Leonardo da Vinci. And there is a reason for that. 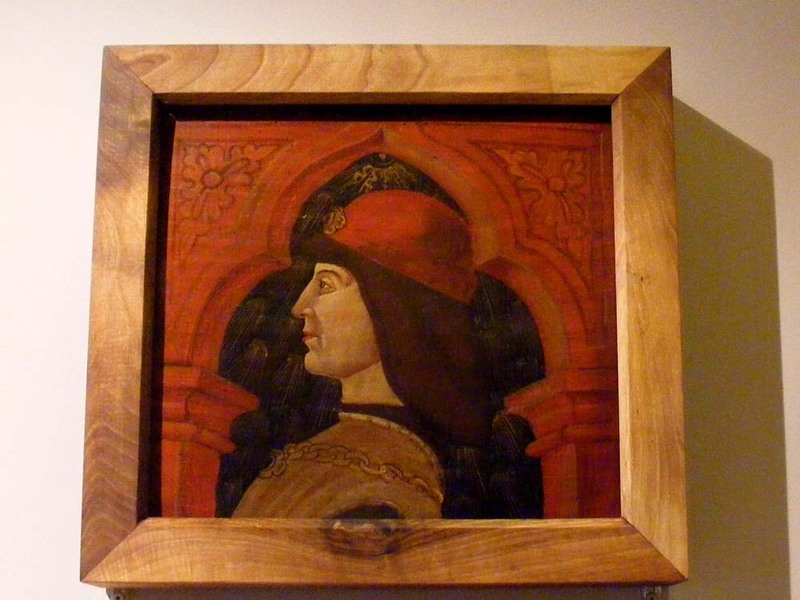 The artist, Francesco Galli, known as Francesco Napoletano, was an early pupil in Leonardo's workshop in Milan in 1490, and one of his most talented apprentices. Very little is known about him. His family was from Naples, but it is not known where he was born. He seems to have died very young, of plague. More than half of his surviving works are Madonnas. This one seems to be the best known. 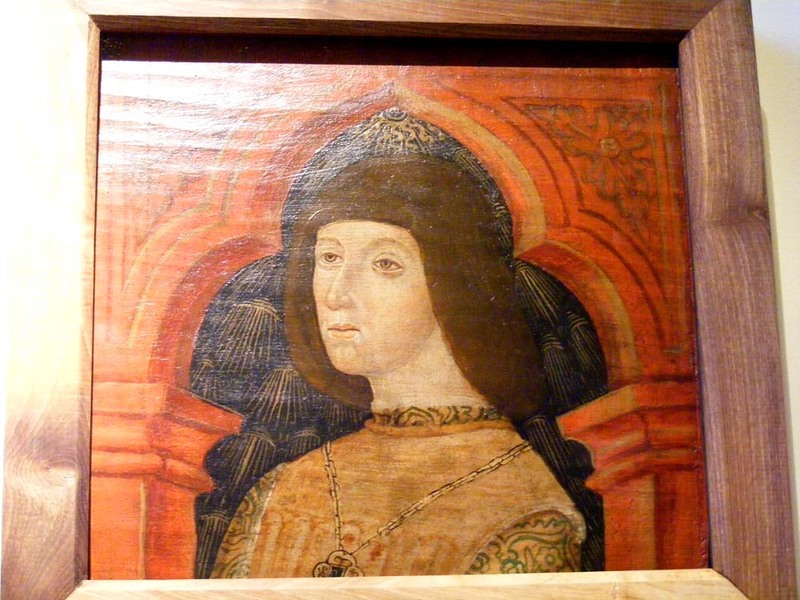 It was painted on board around 1495. It went to an unknown buyer in Milan. 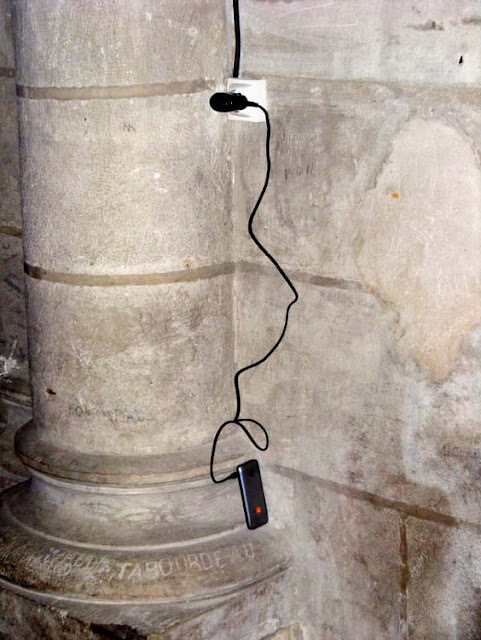 By the 18th century it had found its way to France. (I wonder if perhaps it went to France not many years after being painted, during the years of the French occupation of Milan.) 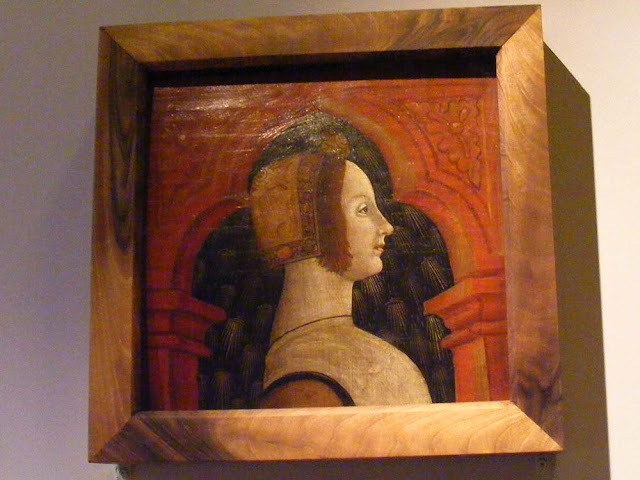 Eventually it was bought by collector Armedeo Lia and came back to Italy. He donated it to the Sforzesco in 2007. The style and setting of this Madonna shows the strong influence of Leonardo (check out the Virgin of the Rocks by Leonardo at the Louvre, for instance). The Madonna's cloak envelopes the baby Jesus and spills over the border. Galli has followed Leonardo's advice about depicting people in the special light provided by bad weather or the evening time. The wall behind the Madonna and the shadows are very dark, setting the figures and the background architecture off dramatically. The scene in the background left is significant because it shows an early version of the Castello Sforzesco and some of the defensive features designed by Leonardo, the earliest indication that they were actually built and not just on paper. 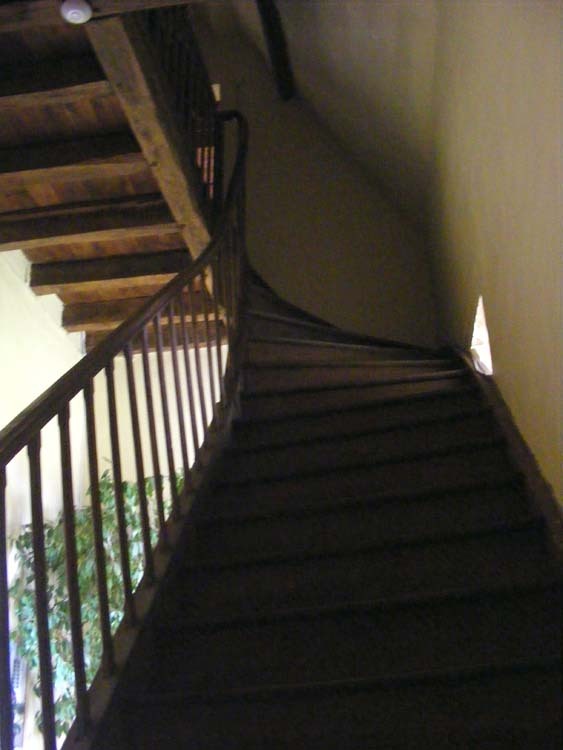 When the Castello was restored in the 20th century the architect responsible used this image as a guide. It is displayed in this unusual way so you can see the back of the painting. Hand written there is a note in French which reads "Out of the wooden board in 1758 where it had been painted by Leonardo da Vinci in 1515 and carried on this canvas Picault painter employed by the King" (not my translation and I foolishly failed to take a photo of the back...). This refers to a restoration by Robert Picault (1705-1781) in an attempt to save the work which was evidently in a parlous state. Interestingly, reference is made to the fact that the work was painted by Leonardo da Vinci, an indication that his Neapolitan student had attained the skill of his master. A la cuisine hier: Preserved Orange Peel, which scented the house deliciously and will be used over the coming months in cakes and chocolate nibbly things and the like. The peels have been festering in their curing mix of salt and sugar for rather longer than necessary, but I finally got to it to yesterday to do the candying stage. Jamaican Curried Prawns, using a curry mix that I make up and have on hand in case I can get hold of some goat meat. I used half a cayenne chili. I only had coconut cream, so this wasn't exactly the lo-cal recipe the original intended. I upped the quantity of red pepper and onion too. We both agreed it was rather good. Stewed apple and blackberries from the freezer, served with fromage frais battu, a delicious product that our laitière delivers. 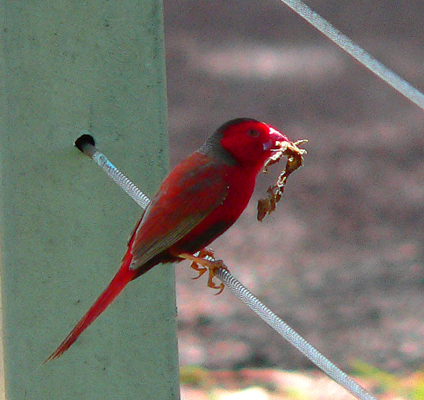 The Crimson Finch Neochmia phaeton is found in wet savanna in tropical northern Australia, Papua New Guinea and Indonesia. This one was photographed at Fogg Dam in the Northern Territory. It is a male, busy gathering nesting material. To be honest, I don't suppose these stables are medieval, strictly speaking, but they are certainly in the medieval section of this privately owned chateau in the Brenne, and they are certainly not modern (maybe Renaissance). The stable corridor, with stalls on the right. I thought it was odd that the corridor and all the doorways were so narrow. 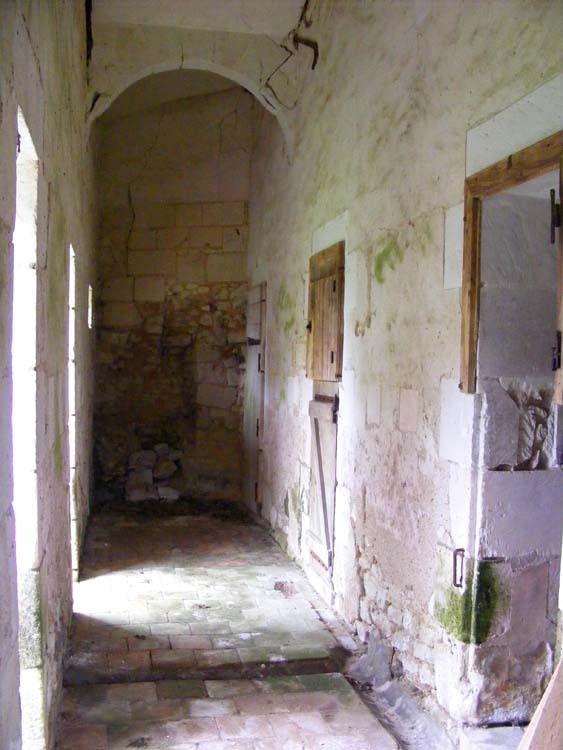 The stables are currently empty, but have clearly been used in living memory. I quizzed the owner about how they managed to get horses in and out, but I didn't understand her explanation and the conversation moved on so I never returned to the subject. Curiously the stalls themselves are very generously proportioned. A chute in the ceiling, used to drop hay down to the stable from the loft above. A la cuisine hier: Spaghetti with creamy tomato sauce followed by stewed greengages from the freezer. Italian Sausage and Cabbage Stew, which is certainly cabbagey and makes enough to serve 12, so we've got plenty for the freezer. I used herb chipolatas and home cooked lima beans, as well as adding carrot and chorizo. 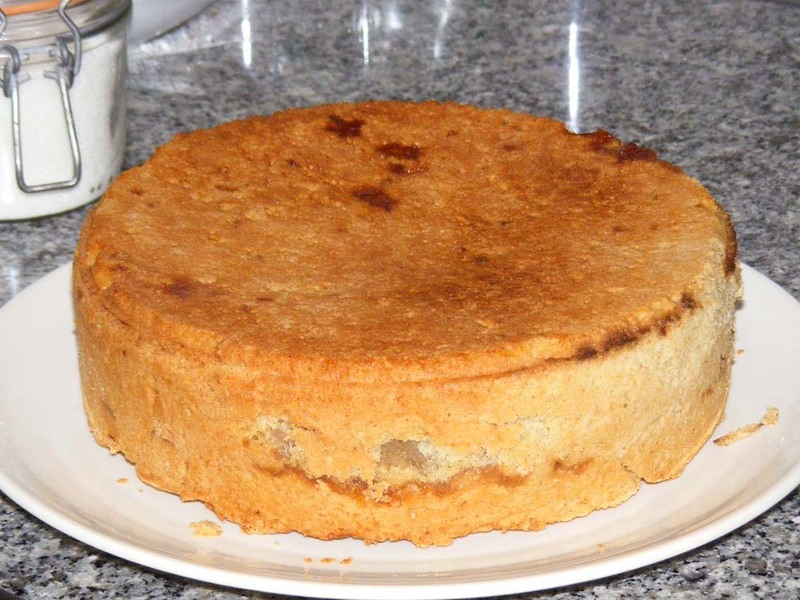 The last of the Persian Love Cake left over from Cake Club. In late January I went on the annual hibernating bat survey. As usual we shared lunch together at Jean Claude's house and it was all very convivial. French bat surveyors naturally have a three course lunch with wine. We started with kir for aperitif. Bread and red wine was put on the table, then salads and charcuterie, followed by cheeses. My contribution was dessert and I made a recipe I got from David Lebovitz's site called French Apple Pie. Simon and I have often observed this phenomena, and David Lebovitz remarks on it in his post too. 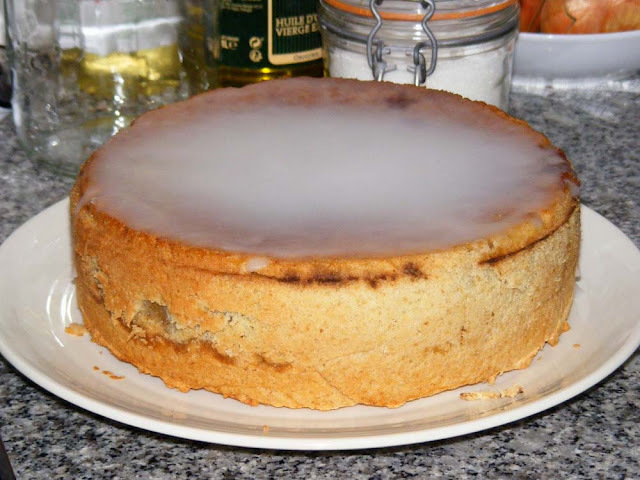 If a recipe name includes a place, it invariably has nothing to do with that place and is unknown there. Feel free to list examples in the comments section below. Let's see how many we can come up with! 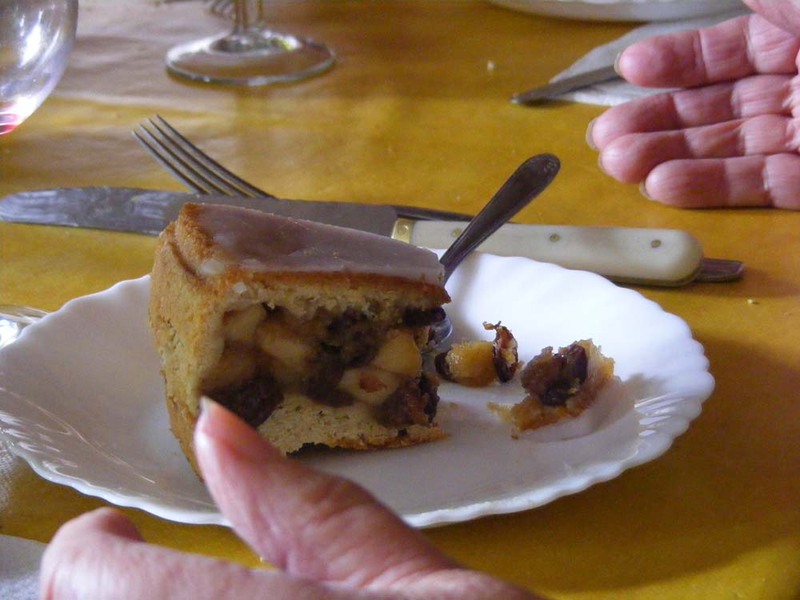 Despite its French free origins, the pie went down extremely well with the assembled bat surveyors, with several people having seconds. 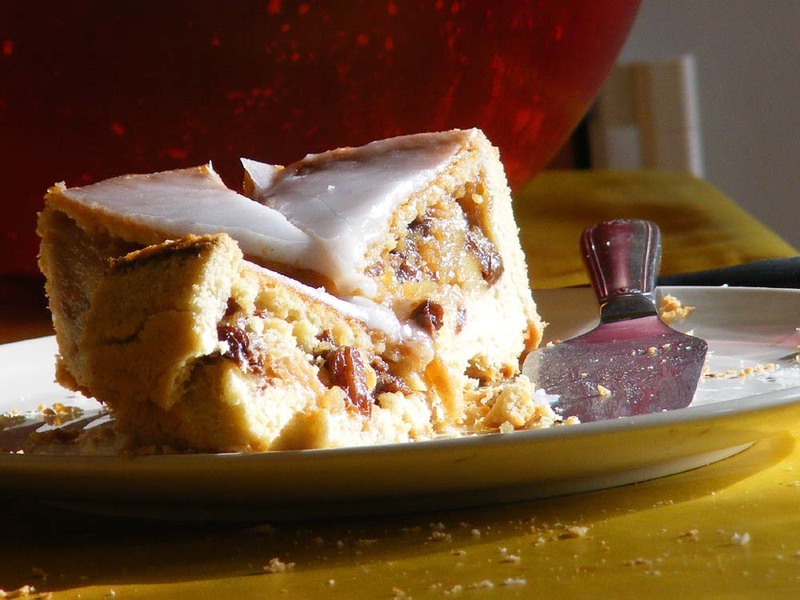 I used calvados instead of rum, and sultanas instead of raisins or currants (I've never been able to see the point of raisins or currants when you can get sultanas, which are so much nicer.) 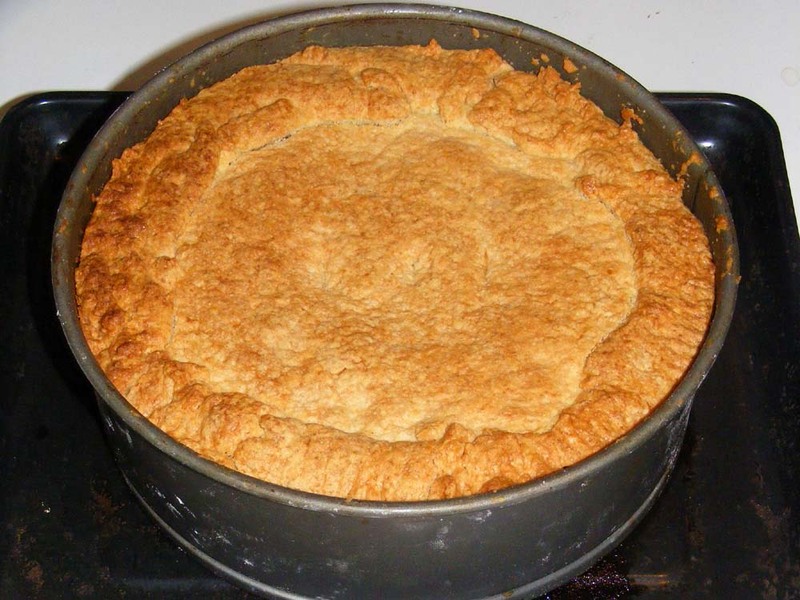 I used a mixture of two varieties of our homegrown apples, Golden Delicious and Jonagored. Loire Valley Nature: A photo of an uncommon variety has been added to the Trompette des Morts Craterellus cornucopioides entry. A new entry has been added for Clouded Yellow Colias crocea, a most abundant butterfly in late summer and autumn. A photo has been added to the entry for Common Blue Polyommatus icarus. A photo of the butterfly's underside has been added to the entry for Dingy Skipper Erynnis tages. Two photos of caterpillar nests have been added to the entry for Glanville Fritillary Melitaea cinxa. A photo of botanists photographing a butterfly has been added to the Association de Botanique et de Mycologie de Sainte Maure de Touraine section of the Resources entry. Spotted in the Church of Saint Denis in Amboise. I think this constitutes a Top Travel Tip, or a wizard wheeze if you are living rough. The owner of this phone was, I suspect, discreetly taking advantage of some free electricity. I assume it was the young man I later saw on the phone, outside the church as we left. 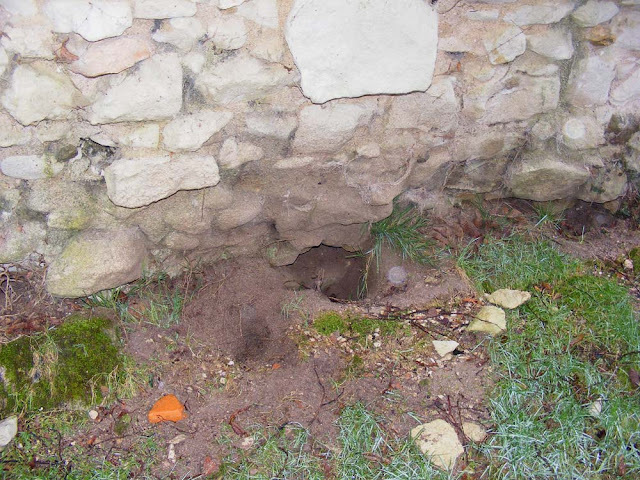 The badgers at this privately owned medieval chateau in what were once the badlands of the nearby Brenne are busy undermining embankments and walls. The main entrance to their sett is under the tree below, to the right of where I was standing to take the photo. The tunnel goes under a causeway which at one stage I think must have been the driveway to the chateau. 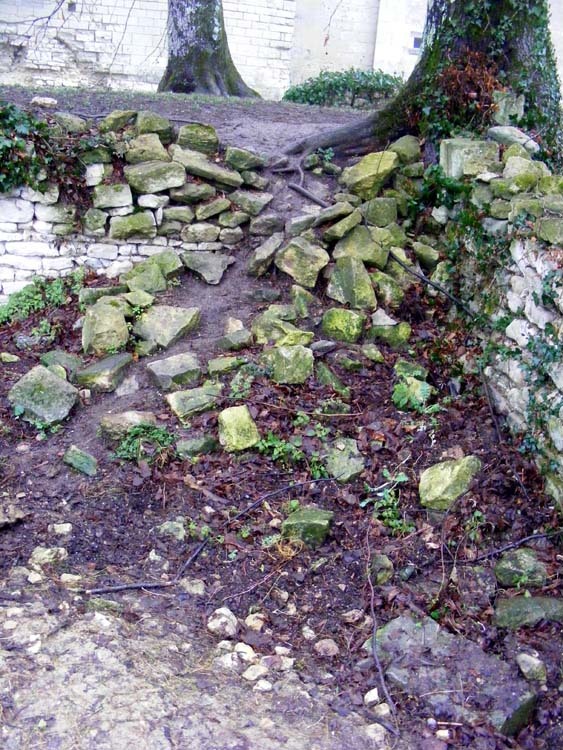 The wall on the other side is beginning to tumble too, as the badgers just motor their way across the top and down the slope of rubble. Once on the other side of the causeway they are in the old moat, now a courtyard. 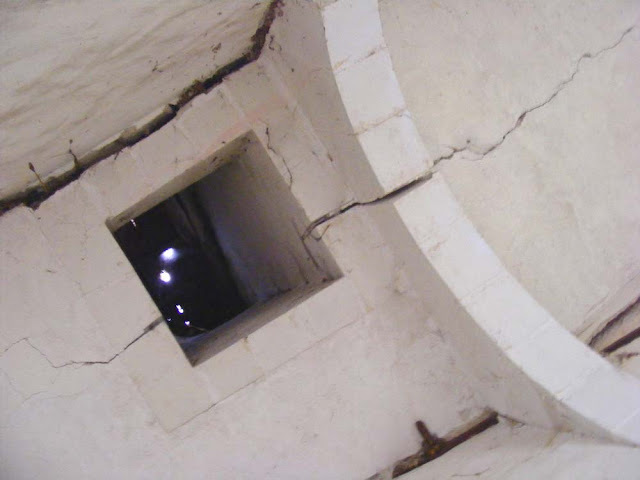 The hole in the photo below is directly under several storeys of substantial chateau building. This is about in the middle of the back, roughly where the residential part ends and the stables begin. 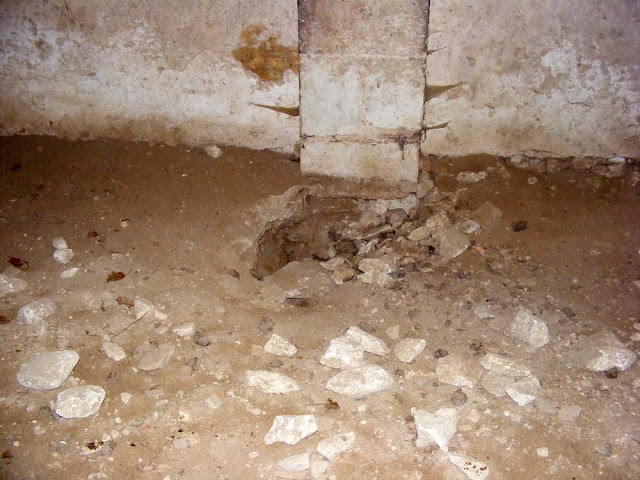 This hole (below) is inside the stables, under an external wall, but not in alignment with the hole on the outside in the photo above. These two holes (below) are inside the stable, under an internal wall. Goodness only knows how far or where they go. Loire Valley Nature: A new entry for White Elm Ulmus laevis has been added. Significantly, this species is rarely infected with Dutch Elm Disease. A photo of a rather wet botany outing has been added to the Association de botanique et de mycologie de Sainte Maure de Touraine section of the Resources entry. You can't always have perfect botanising weather but it doesn't stop us. A new entry for Wasp Beetle Clytra arietis has been added. This is one of the most charming and pretty of longhorn beetles. A photo of a female Adonis Blue Polyommatus belargus has been added to the entry for that species. A photo of a caterpillar lurking about in our garden has been added to the entry for Swallowtail Papilio machaon. And that's Célestine lurking about in the background. A photo of a spring form Map Araschinia levana on the caterpillar food plant has been added to the entry for this butterfly. A photo of a Fox Moth Macrothylacia rubi caterpillar has been added to the Eggar Moths Lasiocampidae entry. A la cuisine hier: Italian style egg drop soup, with spinach and pasta. Chicken in a Greekish style lemon sauce, served with rice. The Beast of Turin (otherwise known as the Fiat S76) was at Retromobile this year, along with a couple of other world land speed record cars. 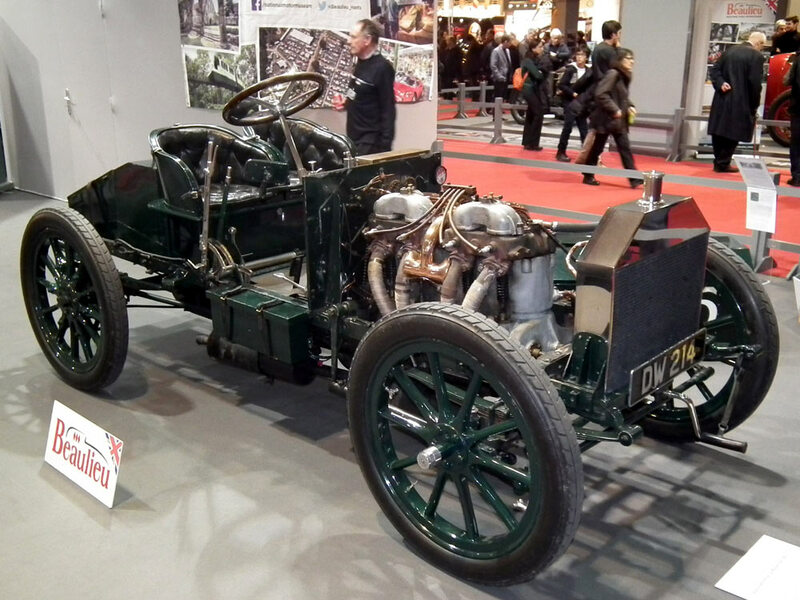 The 1903 Napier, a 7.7 litre 4 cylinder car, the oldest surviving British race car. 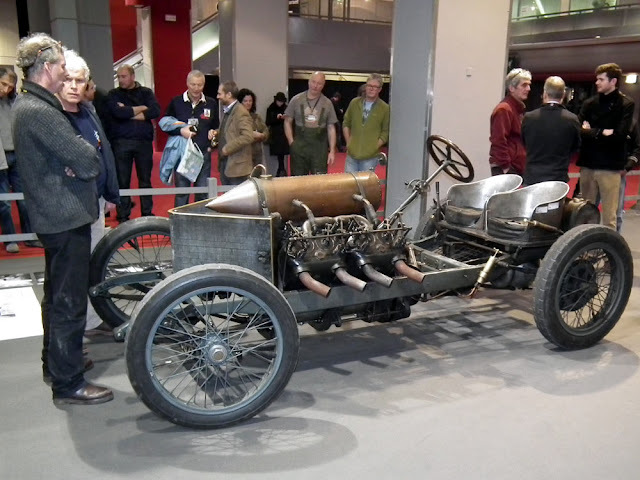 Darracq V8, which was raced in Florida (USA) in January 1906 by Victor Demogeot. The 25 1/2litre cylinder capacity V8(with 200 hp) achieved 197km/h on a dirt racetrack. The Beast of Turin. 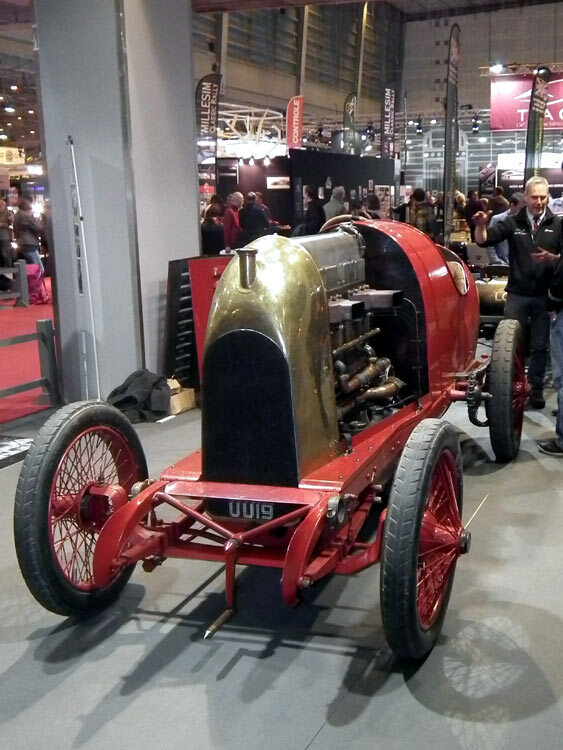 This record-breaking car was designed by Fiat in 1911 specifically to beat the land speed record. Italian engineers mounted the engine – which was originally designed to propel hot air balloons – on a chassis and then built the car around it. 4 cylinders, 300 hp at 1900 rpm for a weight that was not far off a tonne, and a total engine capcity of 28.23 litres (1,730.2 cubic inches). The car managed more than 210 km/h in December 1913 in Ostend. For more on the beast, the Goodwood web site is pretty useful. Car News: Célestine was delivered to the mechanic yesterday. She has a clunk front driver's side that we don't like the sound of. The mechanic doesn't have time to look at her this week, but will do so next week and give us his verdict (and price). A la cuisine hier: Pasta with creamy tomato sauce, made by combining a tin of tomato sauce with a half pot of leftover cream. A few lardons and some good quality Parmesan cheese, et voilà! Beef in stout stew and mash from the freezer, served with steamed broccoli. Rhubarb and apple flapjacks from the freezer to follow. Served with a glass of Chateau Gaudrelle sec tendre 2009 Vouvray, which went remarkably well. 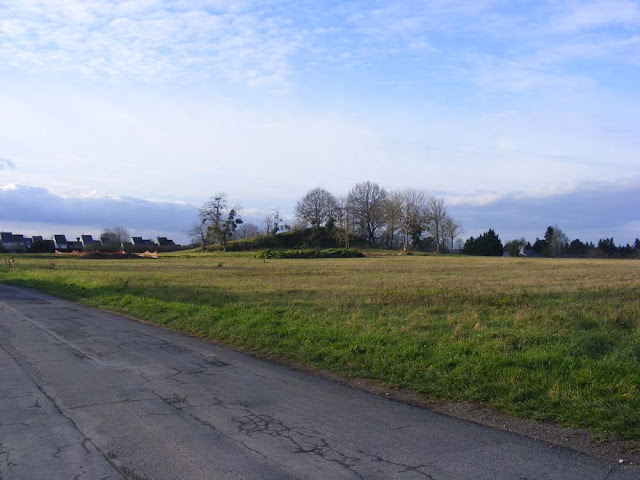 Loire Valley Nature: A new entry for Choke Epichloe typhina has been added. This relative of Ergot will weaken pasture grasses, but not cause the outbreaks of disease that Ergot still occasionally does. A new entry for the commonest moss on Earth, Cypress-leaved Plait Moss Hypnum cypressiforme, has been added. How many times have you seen portraits of unknown people by unknown artists? Gazillions, I'll bet. So here are some more. These are four of a set of thirty-two which today hang in the Castello Sforzesco in Milan. 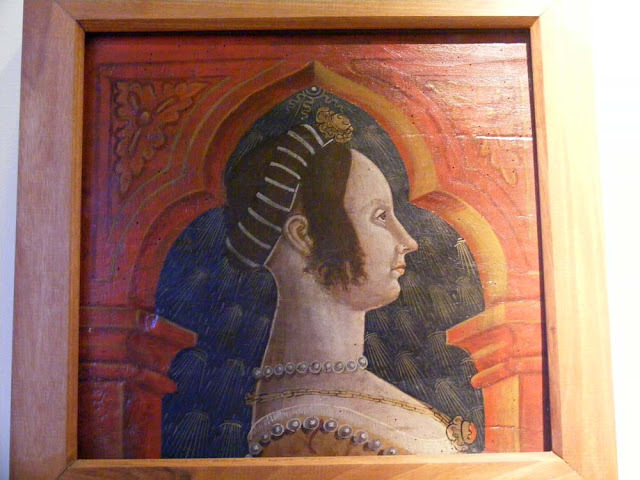 When they were painted it was fashionable to commission profile portraits of family and friends and fix them to the ceiling beams and other objects around the home in Lombardy. It seems to me, from the slightly odd backwards leaning posture of the figures that they did indeed sit for the portraits. Because of the angle of view, looking up at them slightly and into an ornate external archway, I initially thought of them as standing figures, but they must have actually been seated on low backed chairs I think. Their background beyond the archway is rather mysterious. Does it represent the night sky, and if so, why are they portrayed at night? Is it just because the dark sky contrasts well with their pale flesh and rich attire? Another mystery is why the second young man is a three-quarter portrait and not the strict profile of the others. Was his portrait originally hung somewhere like a corner, where it looked better to have the sitter turned slightly? A la cuisine hier: Spaghetti carbonara. The real thing. No peas. No cream. Just cheese, lardons and eggs. I haven't made it for years (decades maybe). I was pleased with how it turned out, because it can be tricky. Loire Valley Nature: A photo of an old ford over the Vienne has been added to the entry on Big Rivers Habitat. A photo has been added to the entry for Agile Frog Rana dalmatina. This Italian saddle in wood and carved staghorn dating from about 1500 gives every impression of being acutely uncomfortable. 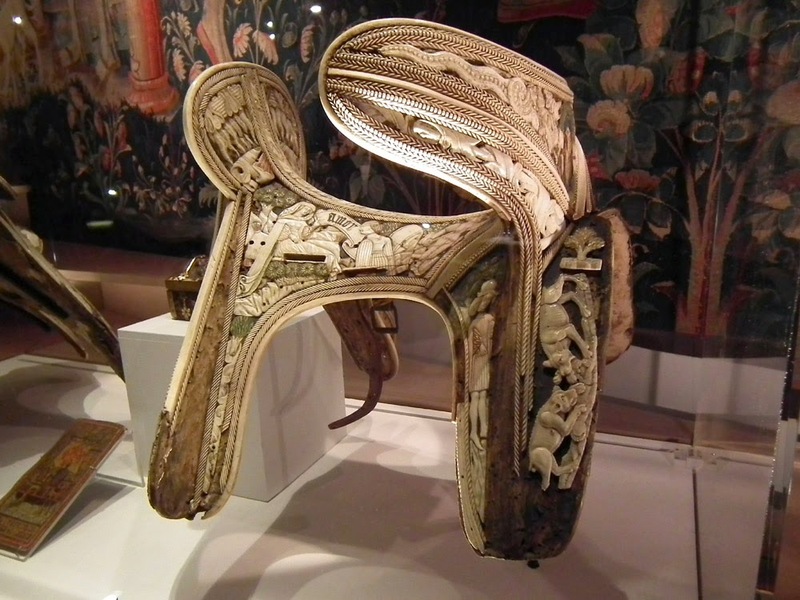 Fortunately saddles like this were for ceremonial purposes, not for journeys of any length. I would guess by the word 'amor' featured on the seat that this one was made for a wedding procession, but it may not have been. Romantic tales of love and virtue, of knights and maidens, were a popular motif for carved bone objects in this period. The staghorn is carved to give the appearance of ivory, but staghorn is cheaper, more easily available and stronger. 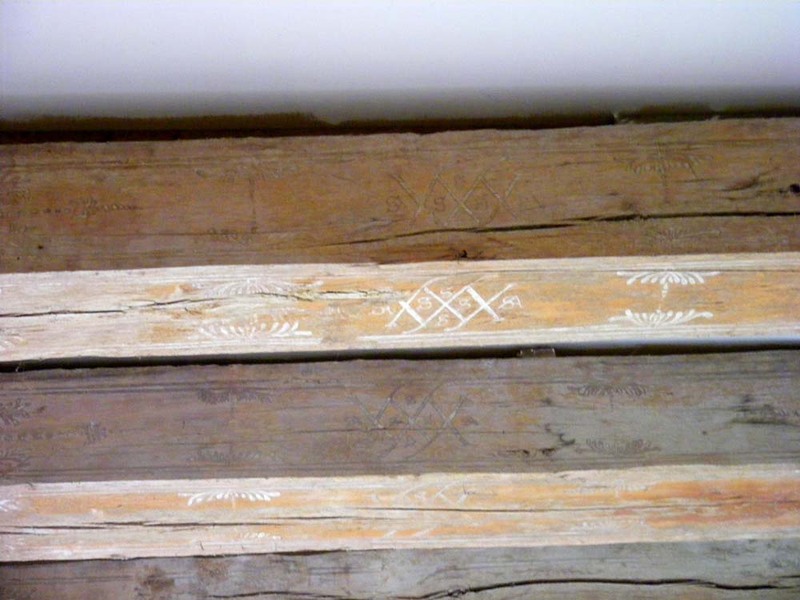 The saddles show signs of polychrome painted decoration and gilding as well as signs of use. It seems there were good practical reasons for making them out of staghorn, even if that didn't include the comfort of the rider. Simon photographed it for me last year in a temporary exhibition at the wonderful Cluny Museum in Paris. If I remember rightly it was on loan from a Florentine collection. There are only 29 of these saddles extant in the world, all held in museums. Loire Valley Nature: Two photos of a male have been added to the entry for Common Blue Polyommatus icarus. This little butterfly may be common, but the males are so pretty they always gain my attention. A new entry has been added for Western Willow Spreadwing Lestes viridis, a common metallic emerald damselfly. A la cuisine hier: I was thoroughly grossed out whilst washing up. Washing up, or more precisely, washing up water, is amongst the grossest substances on Earth, but yesterday had added grossness. As I was scrubbing away at some pan or other I noticed that a sizeable Leopard Slug Limax maximus was emerging into the sink from the overflow trap. The gap available for this manoeuvre was only a couple of millimetres, but the slug was able to squeeze through with no problem despite its size. Normally I'm a live and let live kind of creature, and don't mind slugs going about their daily business. But this was too much. Since I was wearing gloves I grabbed it and after a bit of a tussle managed to extract it and dispose of it. Simon is now working on ideas for flooding the overflow with boiling brine in case there is a family down there. They certainly live somewhere in the kitchen or laundry, as we are always finding them (or evidence of where they've been) indoors. 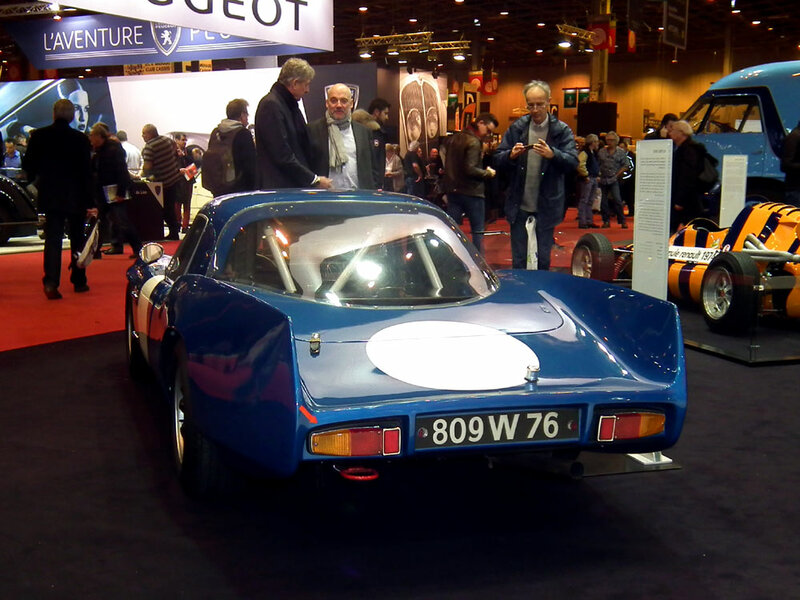 As is our customary want, we went to Retromobile again this year. 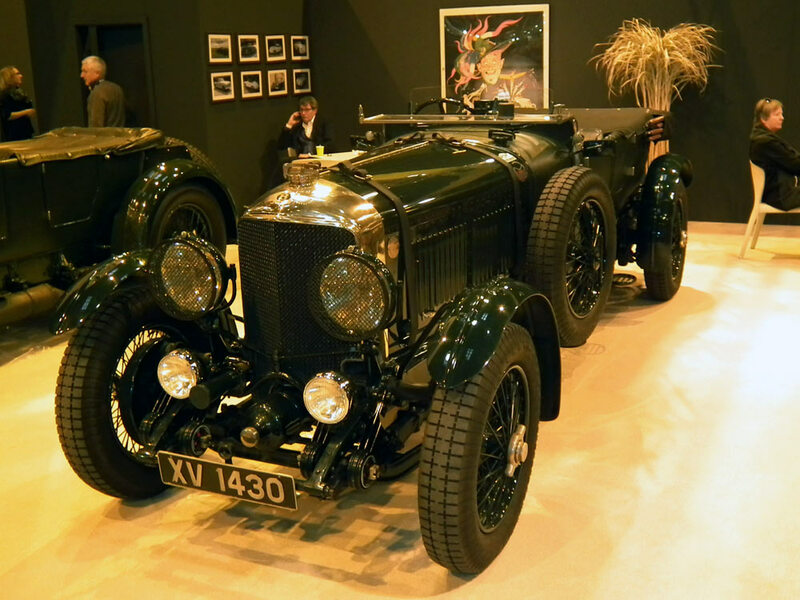 And as is my other customary want, I took a photo of a Bentley Speed Six, because of all the cars in the world, at age 10 all I wanted was a Speed Six Bentley, because they were the biggest, fastest cars ever. So maybe not the biggest, but I still want one. 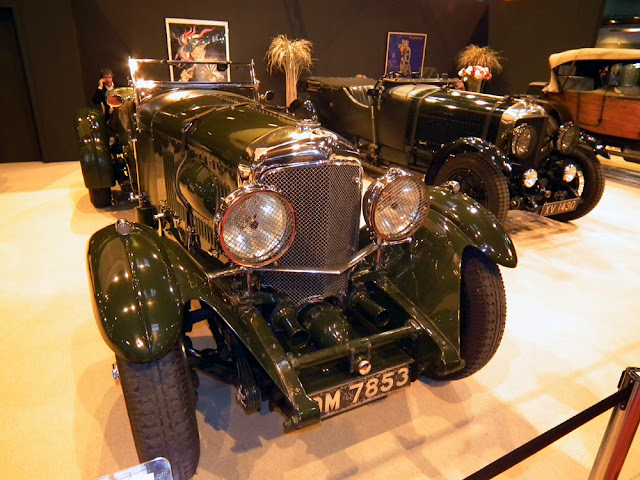 And I will have its big brother too, because what's an extra million euros between friends? Who wouldn't want an 8 litre, straight 6 open sports car bigger than some member states of the United Nations? 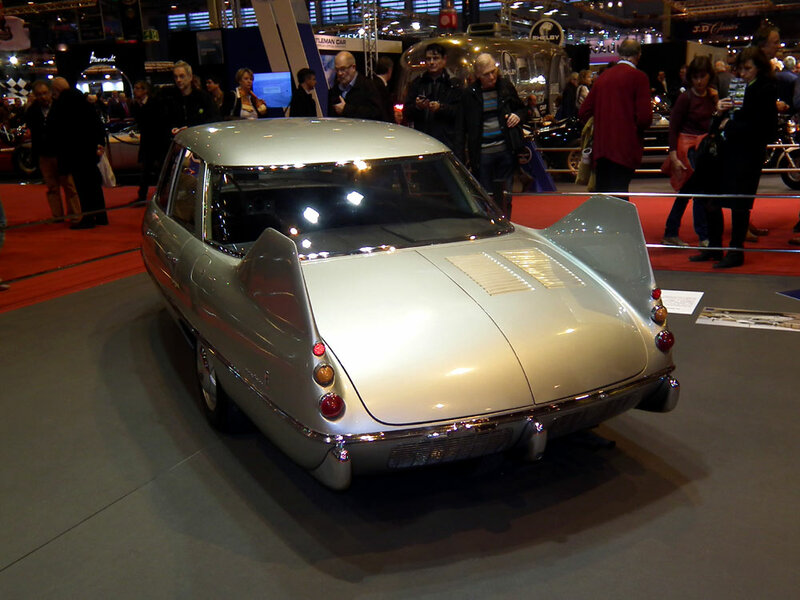 There will be other Retromobile photos to follow, because there were some really interesting cars there (not all of them beautiful). Au jardin hier: The almond tree is in full blossom in the orchard. Almonds are very early flowerers but we won't get any almonds, we almost never do. This year the week of wet windy weather will prevent any possibility of pollination. The Abricot Rouge plum is very close to blossoming too. Talking to one of the Bio Boys at the market he commented that the rain is no problem, welcome even, but the wind has caused a lot of problems, ranging from being horrible to work in to punching holes in polytunnels and whipping apple trees around. We are expecting gusts of up to 110 km/h today and have an orange weather alert. A la cuisine hier: Cheese Crisps, which we have a lot for lunch because they are quick and delicious. Loire Valley Nature: An entry has been added for English Bluebell Hyacinthoides non-scripta. Many of you may think you have this plant in your garden but it is almost certainly a hybrid garden cultivar, not the wild species. Back in October last year I blogged about the Chateau de la Bourdaisière. In the course of researching the blog I encountered tantalising hints that there may be a statue modelled on Marie Gaudin, the beautiful chatelaine of La Bourdaisière in the 16th century. At the time I was unable to ascertain if the statue still existed and if so, where it was. Luckily a blog reader provided the answer for me and as a result I was determined to visit Saint Denis' church in Amboise, which is where the statue has ended up. Saint Denis turns out to hold all sorts of treasures, and I thought it would be a nice outing for a group of friends to enjoy together. 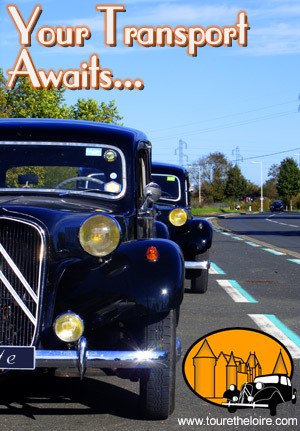 We picked up Antoinette and headed off for Amboise one winter Saturday afternoon. Meeting us at the church were Rosemary and Jean-Michel who drove over from Blois, and Janet and Antoine, who walked from their nearby home in Amboise. The church did not disappoint and we had a most interesting time. 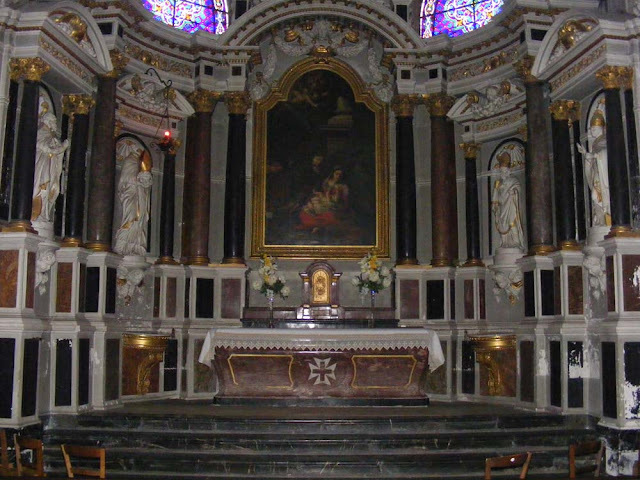 The blog reader, J-L M, who had sent me off to Saint Denis in the first place had mentioned that the altarpiece (Fr. retable) was worth looking at, so after checking out the funerary monuments which the main reason we were here, we went to admire the altarpiece. The first thing that strikes one is that it is huge and very Baroque. It was difficult to date. My initial reaction was that it was 17th century, but we knew the church had been extensively renovated in the 19th century and some of the altarpiece looked a bit suspiciously 19th century Baroque Revival. Then we spotted a beardy bloke delivering a blessing from on high. Much discussion about who he was ensued. It couldn't really be God himself could it? I suggested Moses as his hairstyle could be interpreted as concealing horns, but there were no tablets. Rosemary suggested Saint Peter, but he wasn't holding a key. None of us bothered doing anything sensible like properly reading the blurb in the info folder at the back of the church (well, actually I did eventually glance at the page on the altarpiece but gleaned no more than that it dated from 1702). The truth is we were all having too much fun speculating and talking amongst ourselves. Once home I check out the official Listed Monuments entry for the altarpiece and discovered that the bearded gentleman is indeed God and the altarpiece is indeed mostly 17th century. Apparently the Council of Trent in 1563 had reaffirmed traditional Catholic doctrine that depictions of God were not controversial, but they remained relatively uncommon, and artists were nervous about showing God's whole person. Normally he appears, as here in Saint Denis, as no more than an upper half. 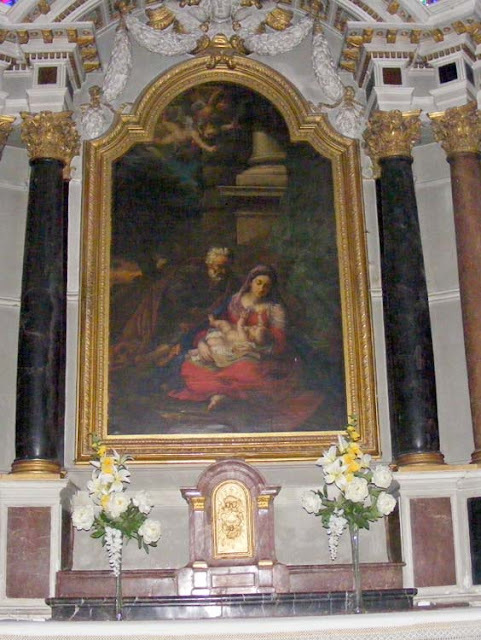 The Holy Family by Claude Vignon. The altarpiece is semi-circular, with the central painting above the altar of the Holy Family (resting during the flight from Egypt) by Claude Vignon (1593 - 1670). 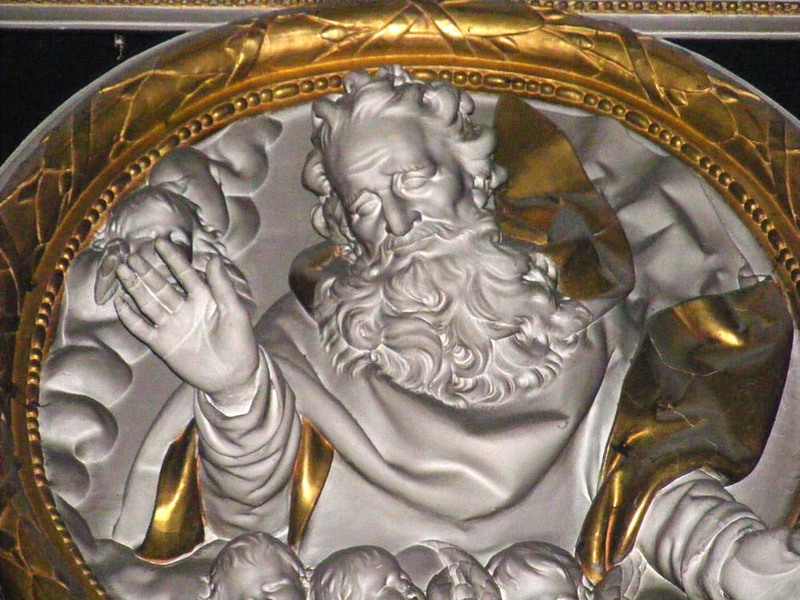 Above the painting, inside a gilded wreath between multiple columns, is the high relief sculpture of God. The curved sides of the altarpiece are richly decorated, alternating statues and columns. On the left the figures are Saint James and Saint Denis (holding his decapitated head in his hands); on the right the figures are an Archbishop of Tours and Pope Urban VIII. Above them are two angels at prayer, adoring God in the centre. My friend Rosemary deserves the credit for the title of this blog and has written her own account of the visit. Loire Valley Nature: A new entry for the Ringlet Aphantopus hyperantus has been added. This butterfly always does well in wet years. A photo has been added to the entry for Scarce Swallowtail Iphiclides podalirius, a butterfly that is not scarce in France (yet -- its population is now declining). A new entry for Short-tailed Blue Everes argiades has been added. This butterfly is surprisingly uncommon here. A photo has been added to the entry for Small Skipper Thymelicus sylvestris. Trust me, it is possible to see the colour of the antennae tips in the field. Photos of caterpillars have been added to the entry for Eurasian Swallowtail Papilio machaon. I was especially pleased to get the cyclists in the background of the first. A photo has been added to the entry for Violet Fritillary Clossiana dia. Sadly this little butterfly seems to me to have dramatically declined since we have lived here. A photo has been added to the entry for Bee Orchid Ophrys apifera. Such a pretty orchid, even if it is common. Loire Valley Nature: A photo of the spring form of the Map butterfly Araschinia levana has been added to the entry for that species. You would think it is two different species to look at the spring and summer morphs. A photo has been added to the entry for Marbled Fritillary Brenthis daphne, such a pretty butterfly. A photo has been added to the entry for Marbled White Melanargia galathea, a gregarious butterfly. A photo has been added to the entry for Pearly Heath Coenonympha arcania, a butterfly of the dry limestone slopes. A new entry has been created for Purple Emperor Apatura iris, a rare and fascinating butterfly. A photo has been added to the entry for Queen of Spain butterfly Issoria lathonia, a large and elegant fritillary. On the heights of Amboise there is a spur of land with the remains of what was a Celtic then Gallo-Roman settlement on it. It is known as the Oppidum des Chatelliers and the settlement was at its height at the time of Caesar's conquest. The Bronze Age culture who lived here and other places in the Paris Basin are known as the Chassey people. The cut through the bank. The most striking of the archaeological remains is the linear rampart, now cut through so you can clearly see it in section. 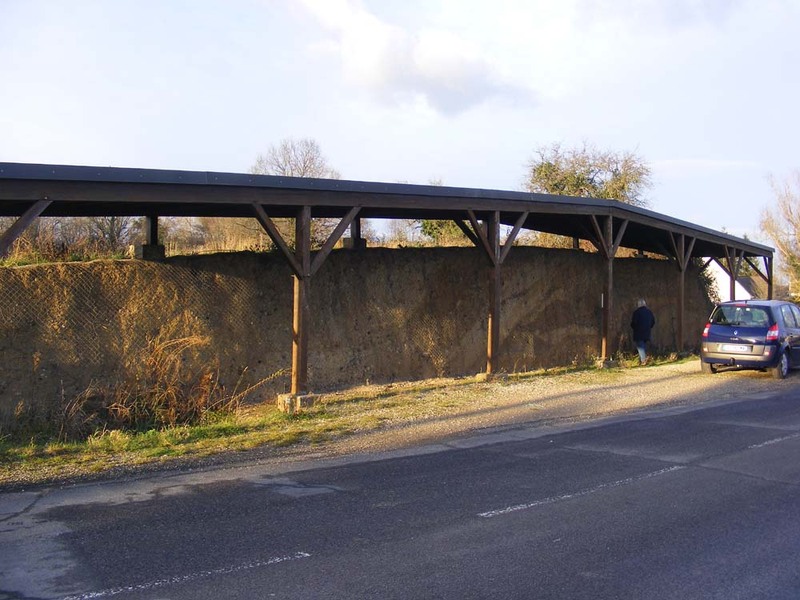 It originally stretched 450 metres and was around 35 metres wide. Its height was once much greater than today. Its reduction was brought about once the plateau began being ploughed and cultivated. In front of the earth bank you can see a flat bottomed ditch. exposed earth to make their nest holes. The earth bank, reinforced with wooden stakes, and surrounded by the ditch, would have been the main defensive element for a settlement called an oppidum in Gallo-Roman times. The very visible strata on the cross section shows that it was added to or had maintenance a number of times over its useful life. On the other side the settlement was protected by the natural cliffs which dominate the valleys of the Loire and Amasse Rivers. 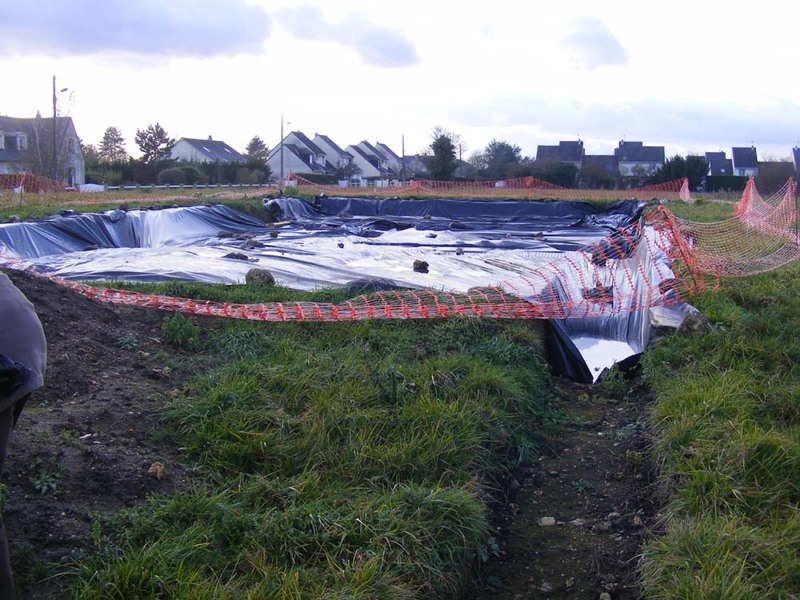 The latest archaeological dig on the site, tucked up for the winter. The Oppidum des Chatelliers was one of the most important cultural and economic centres of the region. 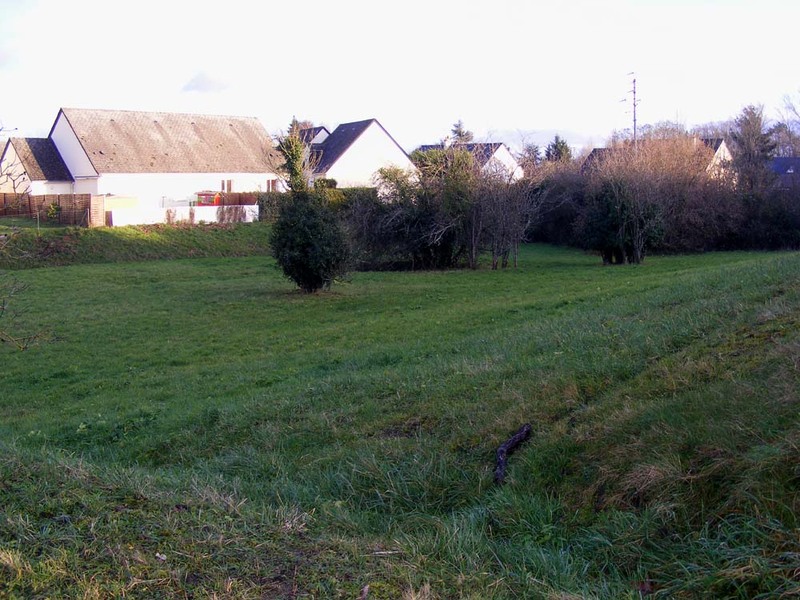 It is also a very typical example of hill forts in the area, where a settlement on a spur above the river is fortified behind a barrier sectioning off the end of the natural ridge. 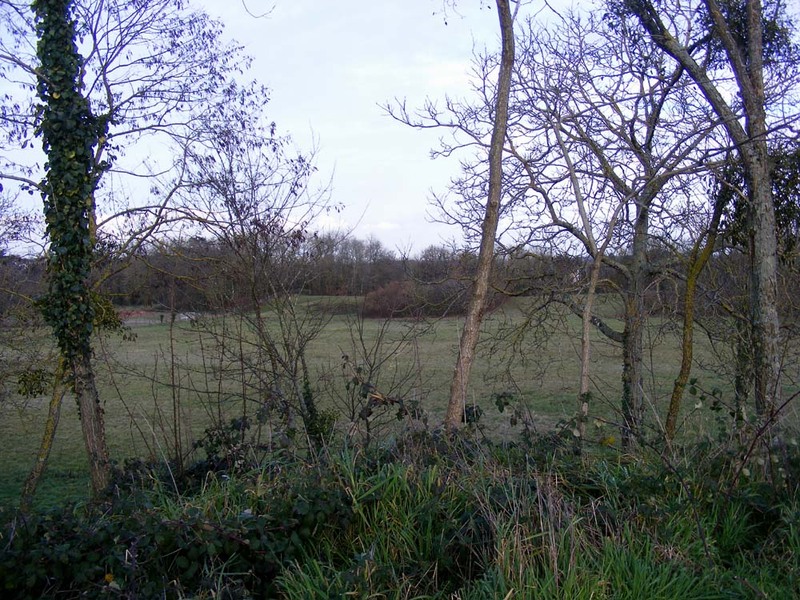 Archaeological research has shown that the site had a population similar to a modern small village and the bank and ditch were begun around 400 BC and finished around 50 BC. Two statues of human form, including an exceptional female idol, have been found on the site. Other finds include pots and Gallic coins. In the middle of the site the tumulus known as la Butte de César. dug the ditch and formed the bank. The view from la Butte de César. We visited the site in mid-January with friends Antoinette, Rosemary and Jean Michel. Rosemary's post about the earth bank is here. Loire Valley Nature: A photo has been added to the entry for Large Skipper butterfly Ochlodes venatus.